Every living organism needs water to survive. It is a catalyst for life, and social and economic growth. A future without it is unthinkable. However, water is not an infinite source, and a combination of climate change and human use is straining water resources all over the world. Goldman Sachs describes water as “the petroleum of the next century”. 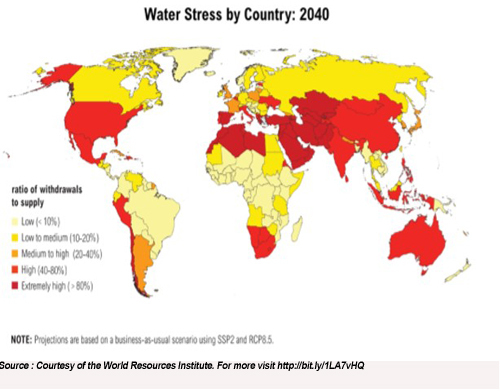 While Dr. Upmanu Lall, director of the Columbia Water Center and a leading expert on hydroclimatology, climate change adaptation, and risk analysis, predicts that by as soon as 2025, large parts of the world could experience perennial water shortages. South Africa has long been considered one of the 30 driest countries in the world. This was the case long before the prolonged drought in various parts of the country. The World Resources Institute, a body dedicated to the protection of the Earth’s environment, projects that Southern Africa will be amongst the most water stressed regions by 2040. Since 2014 many parts of South Africa have experienced prolonged lower-than-normal rainfall that has caused drought conditions. This stemmed from the El Nino phenomenon which together with the effects of climate change has changed global weather patterns and exacerbated dry conditions in Southern Africa. This has put a strain on the country’s already stretched water resources across all provinces. South Africa is typically a water scarce country with an average rainfall that is 40 per cent less than the annual world average. The situation is particularly severe in the Western Cape, Eastern Cape, Northern Cape, as well as some parts of the Free State and KwaZulu-Natal. Currently the Western Cape is caught in the grip of a crippling drought and Cape Town is under pressure to keep water flowing from taps. National government, along with the Provincial government has been working hard to prevent this, however high temperatures and low rainfall has made this almost inevitable. Since 2014 the media has reported regularly on the water challenges facing parts of South Africa. Coverage began to peak during the 2015 El Nino, and has remained high ever since. Below is a snapshot of media coverage by the Chief Directorate Policy and Research from April to August 2017. This report presents quantitative and qualitative content analysis of 1 551 articles on the drought situation. 331 articles were sourced from print media, 1107 from online and 115 from broadcast media. 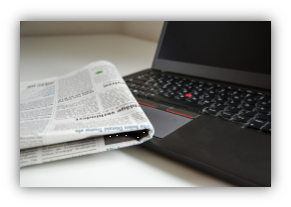 The articles were analysed to determine media coverage trends in terms of volume and tonality, prominent issues that received significant coverage, coverage per media entity, origin, share of voice and the most quoted sources. Prominent issues dominating the drought media discourse included the impact of drought on farming and economic output, dam levels, the implementation of water restrictions and relief initiatives. Reports also highlighted possible mass job losses in the agricultural sector. The Western Cape was under the spotlight as the province was particularly hard hit by drought, and declared a disaster area. The tone of coverage has been predominantly factual, with positive media coverage on innovative solutions to curb the impact of drought as well as government’s relief initiatives. In this period government’s key messages encouraging citizens across the country to save water and report leaks continued to receive prominent media coverage and was endorsed by the media and other commentators. The War on Leaks programme attracted positive media coverage for government. An overview of the most prominent media issues surrounding the issue of drought from April to August 2017 reveals that a number of pressing issues remain top of mind. Most of the coverage during this period was neutral and simply reflected what the issue was. When coverage of all the headlines of all 1551 articles is analysed in a word cloud it clearly shows that the media headlines were dominated by Western Cape and the City of Cape Town as the province was the hardest hit by drought in the period under review. 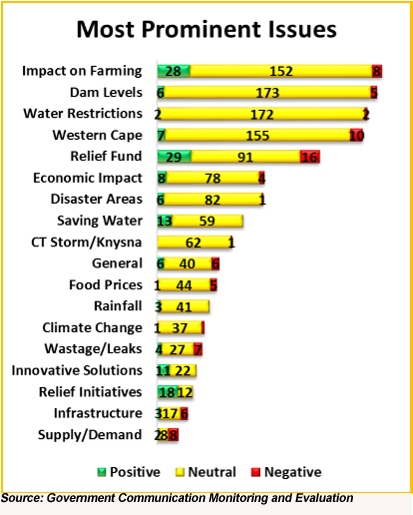 The Western Cape continues to be the hardest hit province, compelling government to declare it as a disaster area. The Department of Water and Sanitation has also moved swiftly to inculcate a culture of water savings throughout the country. Government established an Inter-Ministerial Task Team on Drought and Water Scarcity in response to the persistent drought that threatens food production and water supply. Dam operating rules have been implemented to ensure mandatory restrictions on domestic and agricultural use. It is estimated that an approximate R7 billion worth of water is being lost annually through water leaks. Government has sought to address this wastage through the War on Leaks Programme, which was launched in August 2015. This is an initiative by gov-ernment to train 15000 young people to assist the country to minimise current water losses. The programme enrolled three thousand young people by 2015/16. Government has also implemented measures such as water restrictions in various provinces to help conserve water. During the Water Indaba in June 2017, Ministers, Premiers of all provinces and mayors formed a united front in pledging to enhance water conservation efforts, while reducing water leakages. 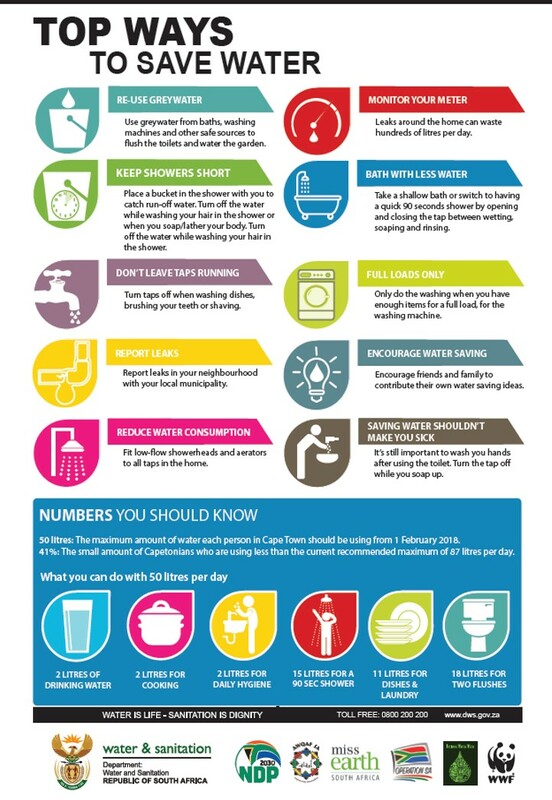 To further deal with the impact of the drought the Department of Water and Sanitation spent over R500 million on short term interventions in KwaZulu-Natal, Free State; North West; Mpumalanga; Limpopo; Western Cape and Northern Cape. Various other localised interventions such as desalination in Cape Town or ground water extraction are also being implemented. The recent announcement by the Minister of Finance of an allocation of R6 Billion in the 2018/19 financial year to augment water infrastructure in the Western Cape‚ the Eastern Cape and the Northern Cape, will also go a long way to respond to the situation. These and other interventions are helping to alleviate the situation, however most of our dams across the country remain under severe pressure. South Africa is considered a water scarce country and is still recovering from the devastating drought that ravaged most parts of the country in the last three years. Therefore our actions in conserving water count; all water users have a responsibility to ensure that every little drop of water is conserved. As the country, we need to inculcate the culture of water conservation to avoid running out of water and save it for future generations. Government has consistently called the public to partner with government in conserving the current water supply. As a country we need to proactively root out unlawful water use and stop non-compliance with water restrictions. 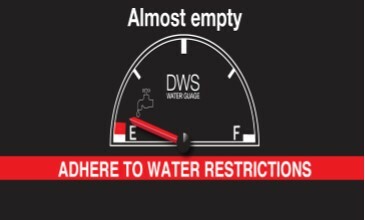 South Africans must adhere to water restrictions whenever they are implemented. When we all play our part we can ensure that there is enough for everyone. It is up to all South Africans to report and fix water leaks. Communities can help recycle water by re-using water for cleaning and washing to water plants or fill toilets. Communities can also harvest rain water which can be stored and used in toilets, for gardening or for washing cars. We must also use municipal water sparingly. 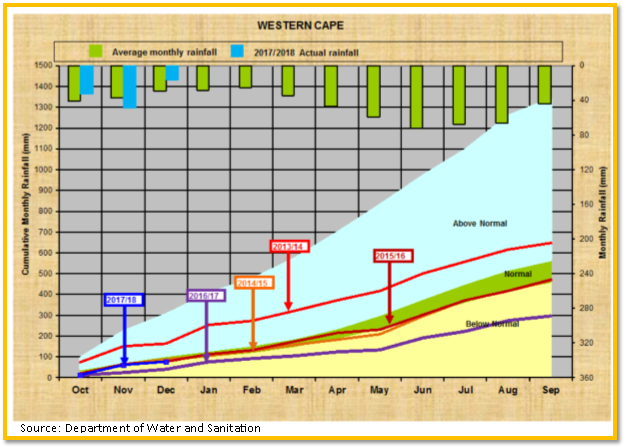 Households and businesses are encouraged to implement water-wise measures which includes the re-use of water. The business sector and private sector can start water saving projects as part of their corporate social responsibility projects. If your school, business or organisation has a pool, fit a pool cover to prevent water loss through evaporation. Saving water and protecting our future is our joint responsibility!